Posted on Mon, Jan 14, 2013 : 12:29 p.m. Co-workers, research partners, neighbors, hunting buddies—you would assume I am referring to types of human relationships, right? Gallery Project's current exhibition, "Interspecies", reveals that all sorts of relationships are formed between different species of wild animals and between us humans and wild creatures. The exhibition will be on display through Feb. 10. Artists, scientists, and documentary filmmakers are exploring instances when different species interact, cooperate, coexist, and sometimes encroach upon or exploit one another. While the more than 30 contributors mainly focus on interspecies cooperation and even instances of camaraderie, the exhibition also includes a few examples of when co-existing goes wrong. The exhibition tells some good "odd couple" stories. For instance, a number of artworks show humans and wild animals working a job together. Rats are trained to sniff out landmines in Sylvain Piraux's series of photographs. Elephants help landscapers in Michael Sarnacki's archival prints. Of particular note, one of David Edwards photographs of a Mongolian hunter and his sidekick, an eagle, was featured in "National Geographic 100 Best Pictures." The eagle hunters of Mongolia devote an incredible amount of energy to training and caring for the creatures, which are still wild animals and not the same as pets. Glimmers of a friendship between them can be sensed when viewing the photographs, even though you cannot read an eagle's mind, obviously. But a bond has definitely formed between them. Such interspecies relationships are "complex and changing," according to an exhibition statement shared by co-curators Linda Kalof, director of animal studies and a sociology professor at Michigan State University, and Gallery Project owners Rocco DePietro and Gloria Pritschet. It is easy to see how Kalof's own research interests relate to the show and why Gallery Project brought her on board for the exhibition. At MSU, she directs an interdisciplinary graduate specialization called "Animal Studies: Social Science & Humanities Perspectives." As a published scholar many times over, a number of her articles, book chapters, and books focus on the cultural history of animals, their significance in human history, environmental values and other topics that relate in one way or another to the "Interspecies" exhibition. She says that her current research interests include "documenting the changing iconography of animals in 120 years of National Geographic." "My academic interests are definitely reflected in much of the art on exhibit. My graduate class last semester focused on urban carnivores and the problems and possibilities of peaceful co-existence between humans and carnivores, particularly coyotes and foxes who are increasingly a part of our urban landscapes," she tells AnnArbor.com. 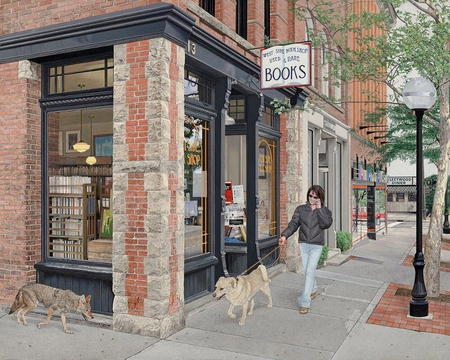 She points out how Rick Pas explores the "Urban Coyote" in his realistic painting of a coyote about to turn the corner at the well-tread alley next to West Side Bookshop on Liberty Street in Ann Arbor. "Humans have destroyed much of their natural habitat and we provide them with great quantities of food in the form of garbage," Kalof explains. Kalof and MSU graduate students Christina Leshko and Jessica Bell contributed "Wild Ties: Mutualism in Human-Wild Animal Interactions" to the exhibit. Fifteen YouTube videos and a poster "illustrate the myriad ways that humans and other species live, work and play together," Kalof explains. Many of the documentary videos in the show were taken out in the field by people who dedicate their lives to being with animals in their natural habits. Charlie Russell, a Canadian naturalist documented living among grizzlies out in the wild, while Cristina Zenato, an expert shark handler, has tuned into Caribbean reef shark behavior so well that she can get one to let her hold it and flip it around—a quite unbelievable feat. A few well-known animal research subjects are included in the exhibit. Among them Alex and Grif, two African gray parrots who were trained by animal cognition scientist Irene Pepperberg, are shown in videos and photos. And some of you will have heard of Panzee, a bonobo with language and writing skills who is studied at Georgia State University's Language Research Center. Art professor Craig Dongoski meets with Panzee and other apes to do mark-making experiments. On display in "Interspecies," Dongoski took some markings the apes made on paper and then reinterpreted the lines and shapes in order to make artworks of his own. It was what you might call an interspecies art collaboration. Kalof, who has never helped curate an art exhibition before, agrees that there may be a difference between the way people absorb information at an art exhibit and how, let us say, one of her students learns information from "book learning." "The subtleties of the visitor experience at an art exhibit begin within the dialectic exchange, such as when the goals of the artist converse with the visitor's frame of reference. In other words, an engaged visitor participates in a form of reciprocity with the work of art, a kind of conversation...through this process a sense of meaning emerges," Kalof says. "Consider the student who is required to read a book on animal welfare versus animal rights. That is not a free-choice learning process—the book is required reading. However, voluntary attendance at an art exhibit that displays Britta Jaschinski's [photographs of a] brown bear and starving tiger creates a unique way of understanding the issues," Kalof says. Jaschinski's photos uncover cruel conditions that animals are living in. Another work in the exhibit that shows how humans can be detrimental to wildlife is Michael Webber's documentary film, "The Elephant in the Living Room," which plays in the gallery's basement studio. The award-winning film documents the controversial exotic pet trade in America, which includes people owning dangerous big cats as pets. For better, and sometimes for worse, we all live together on one planet. "Interspecies" does a nice job of showing just how complex our relationships to one another are. "Interspecies" continues through Feb. 10 at The Gallery Project, 215 S. Fourth Ave. Other artists, scientists, and documentarians featured in "Interspecies" include Margaret J Eppstein, Boryana Rusenova, Norbert Freese, Gay Bradshaw, Carolyn Reed Barritt, Dellas Henke, Beth Kingsley Hawkins, Annie Kilabuk, Ladislav Henka, Nancy Seefelt, Charles Menzel, Marc Bekoff, Michael McGillis, Katie Halton, Elizabeth Shank and Matthew Traxler, James Atkinson, Rocco DePietro, Karolle Wall, Liliana Cortes-Ortiz, Sue Hassard, and Thom Bohnert.